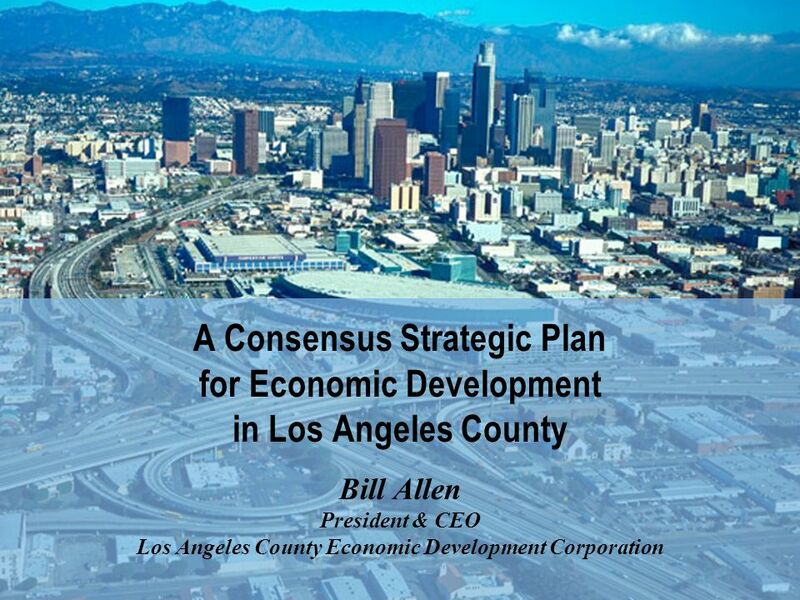 A Consensus Strategic Plan for Economic Development in Los Angeles County Bill Allen President & CEO Los Angeles County Economic Development Corporation. 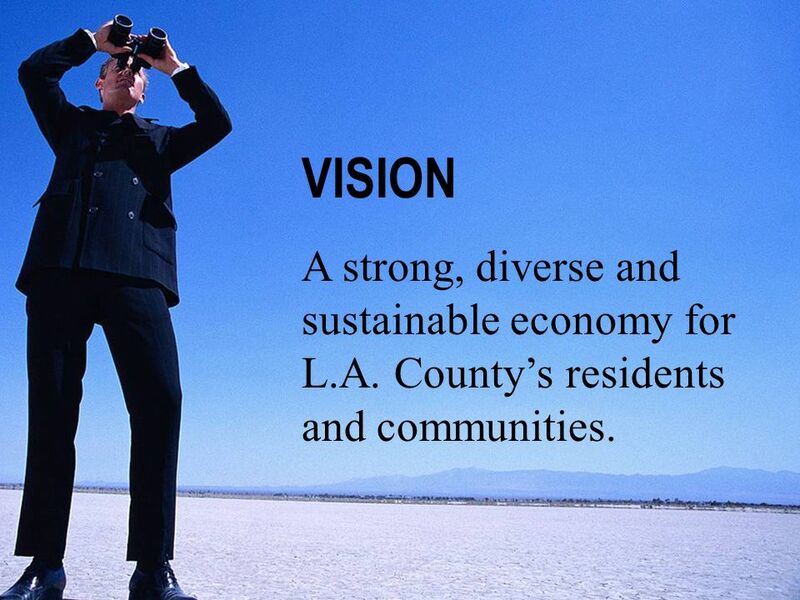 2 VISION A strong, diverse and sustainable economy for L.A. County’s residents and communities. 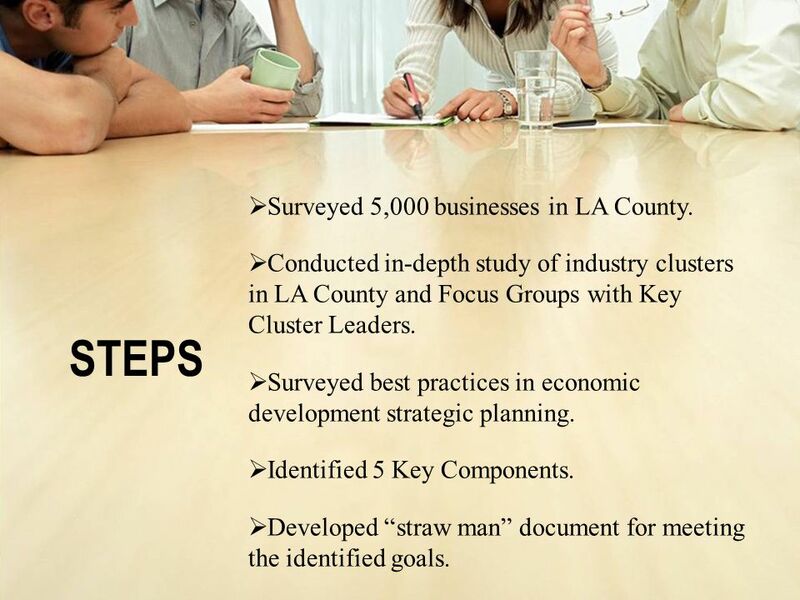 16 STEPS Surveyed 5,000 businesses in LA County. 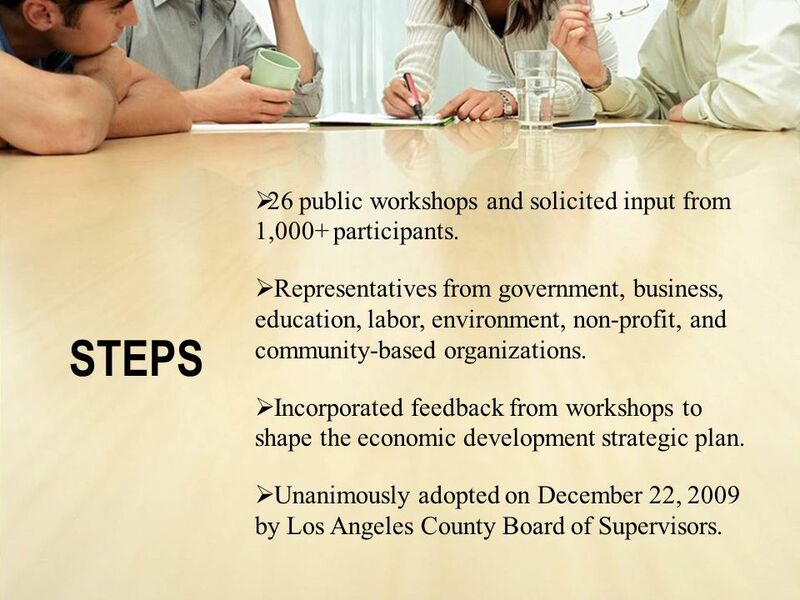 17 26 public workshops and solicited input from 1,000+ participants. 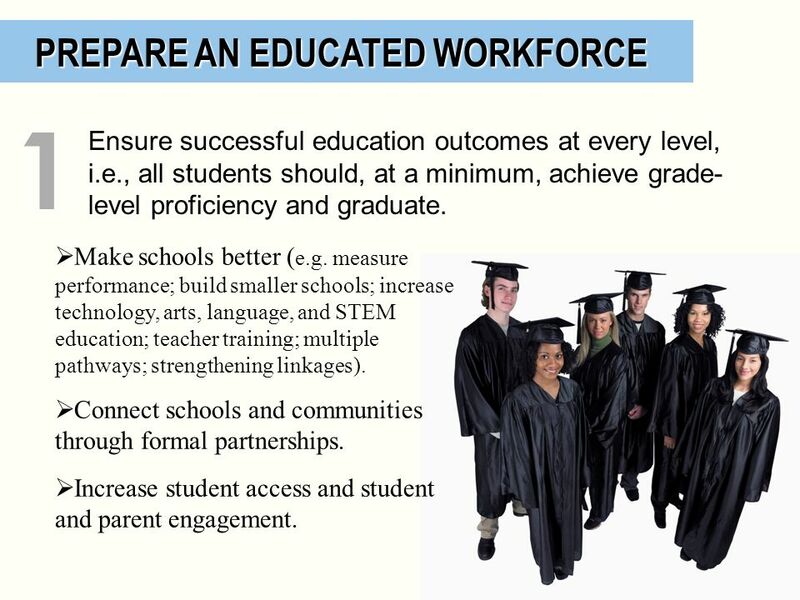 Ensure successful education outcomes at every level, i.e., all students should, at a minimum, achieve grade- level proficiency and graduate. 1 Make schools better (e.g. 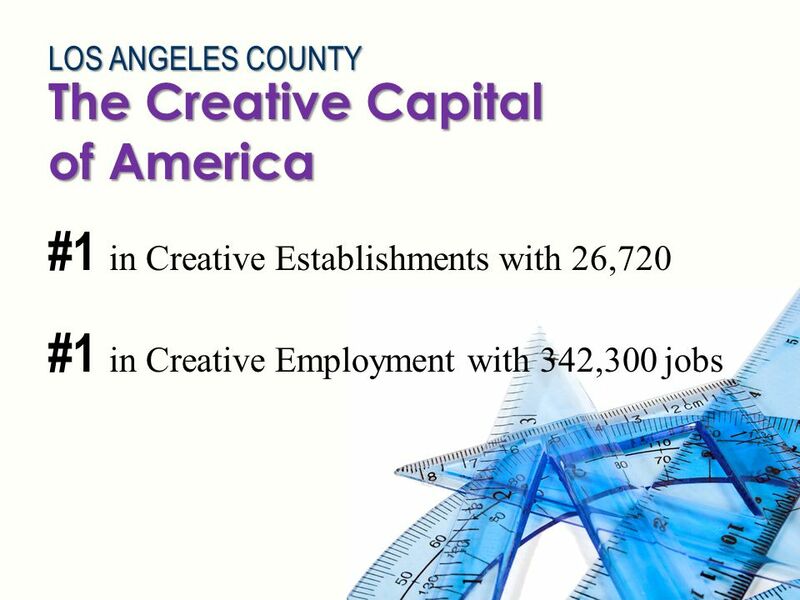 measure performance; build smaller schools; increase technology, arts, language, and STEM education; teacher training; multiple pathways; strengthening linkages). Connect schools and communities through formal partnerships. Increase student access and student and parent engagement. Ensure that businesses have enough workers with the right skill sets to meet their needs. 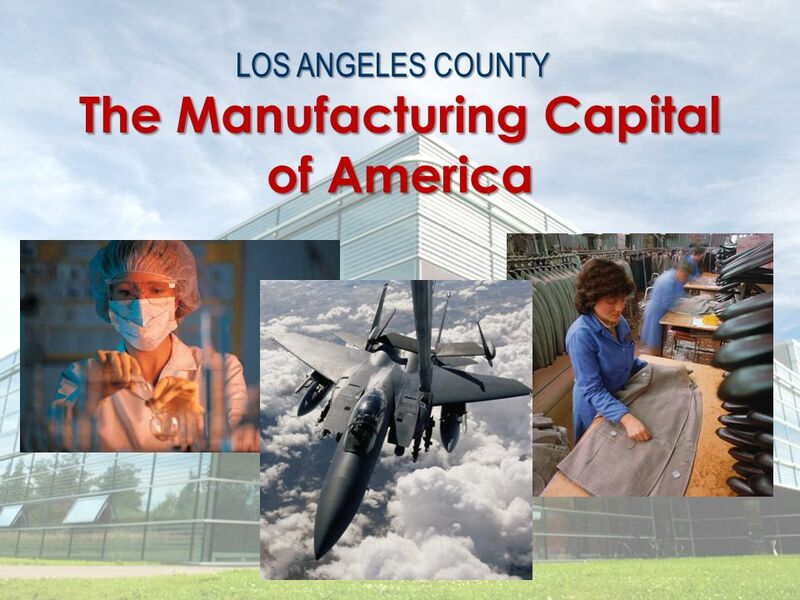 2 Conduct and publish research on workforce shortages and skill gaps. Fund workforce intermediaries. Integrate workforce training activities and higher education. Expand sector-based training. 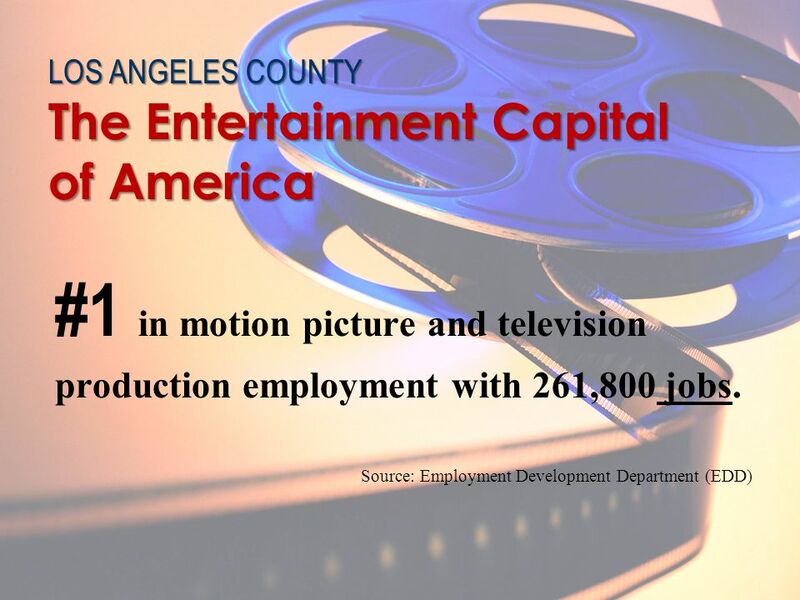 Prepare job seekers and incumbent workers to enter sectors with high-value jobs – as measured by wages, benefits and additional income attracted into the County – and built-in career ladders. 3 Create programs that expand the workforce by reconnecting dropouts. Develop, expand and upgrade the skills of the existing workforce. 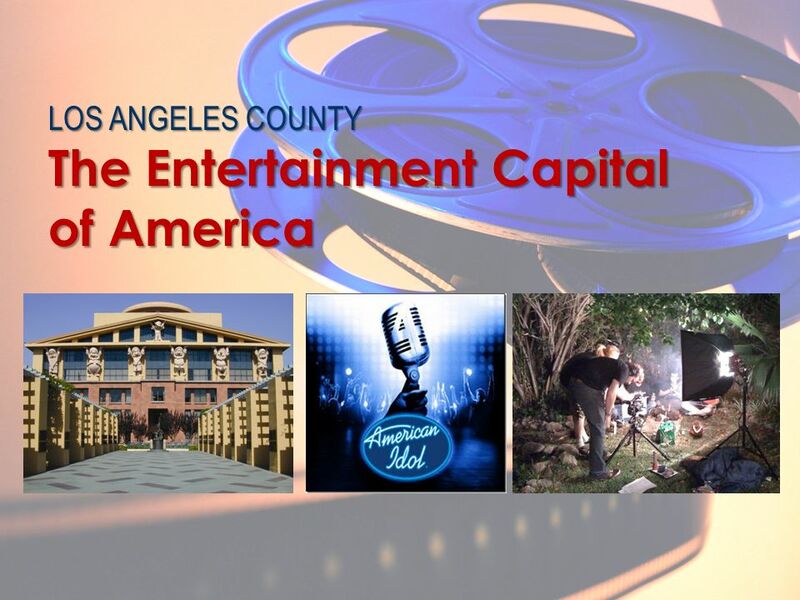 Begin career awareness programs in middle school. 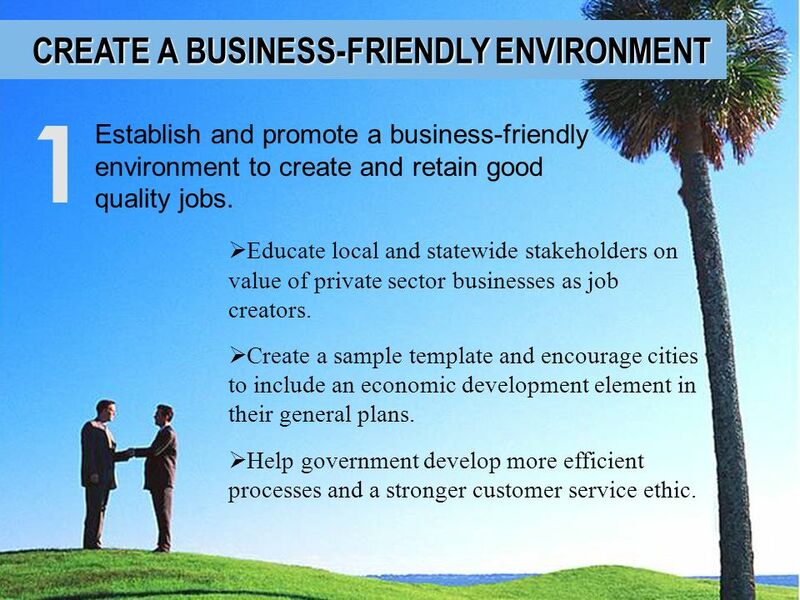 Establish and promote a business-friendly environment to create and retain good quality jobs. 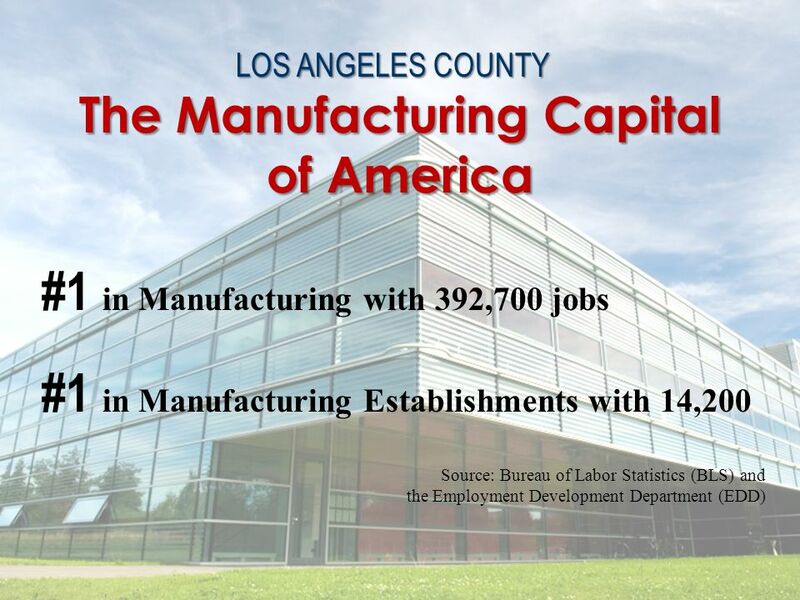 1 Educate local and statewide stakeholders on value of private sector businesses as job creators. 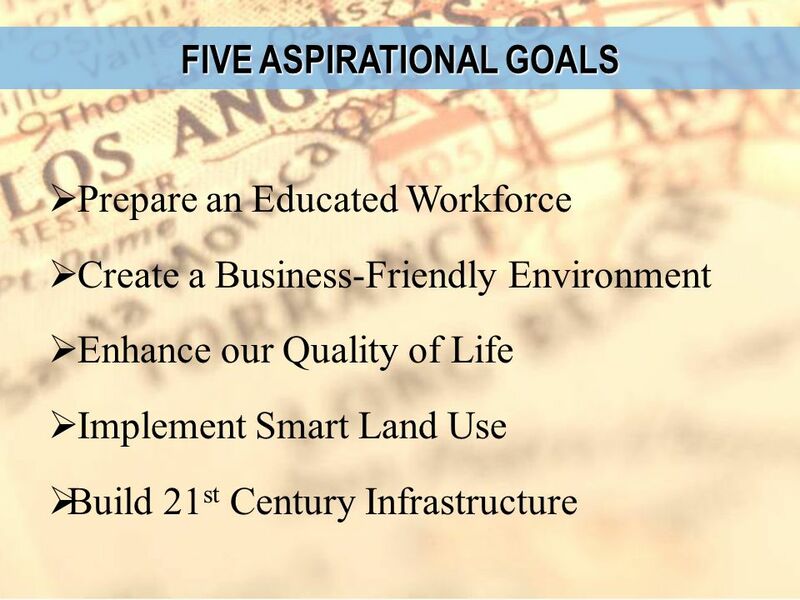 Create a sample template and encourage cities to include an economic development element in their general plans. Help government develop more efficient processes and a stronger customer service ethic. 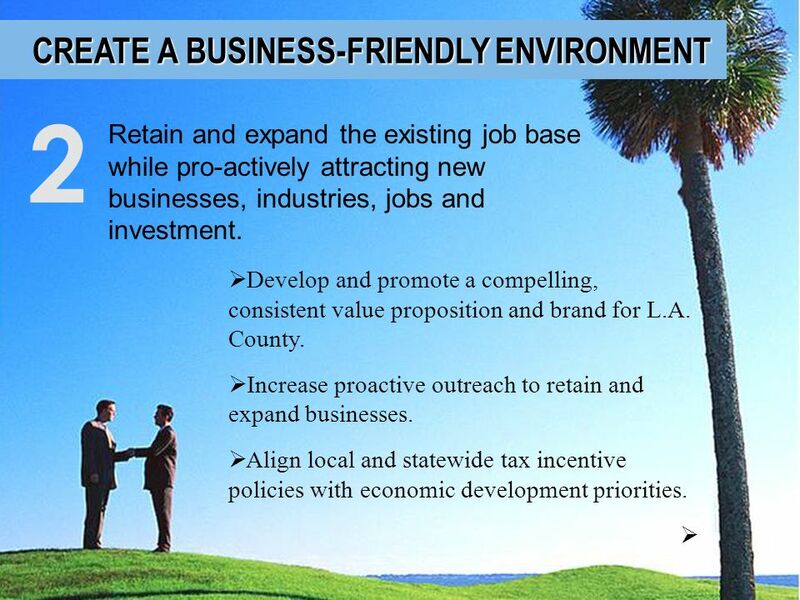 Retain and expand the existing job base while pro-actively attracting new businesses, industries, jobs and investment. 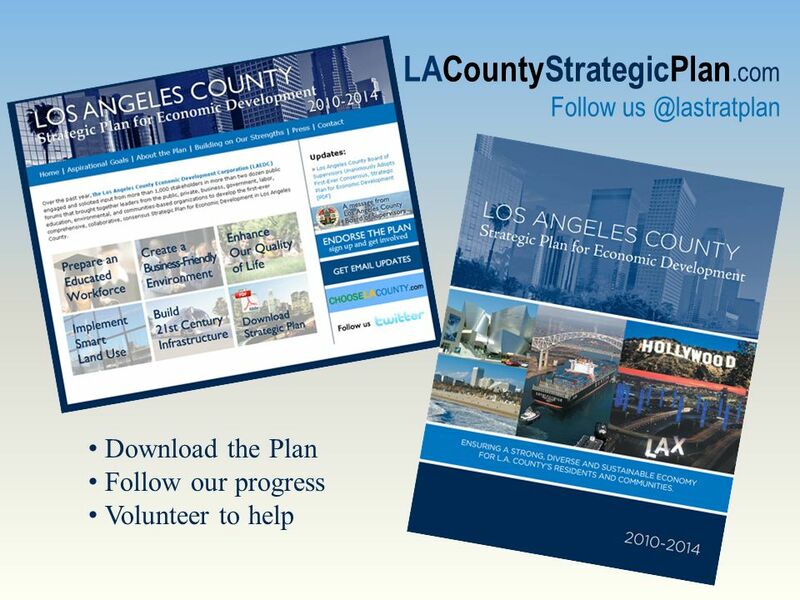 2 Develop and promote a compelling, consistent value proposition and brand for L.A. County. Increase proactive outreach to retain and expand businesses. Align local and statewide tax incentive policies with economic development priorities. 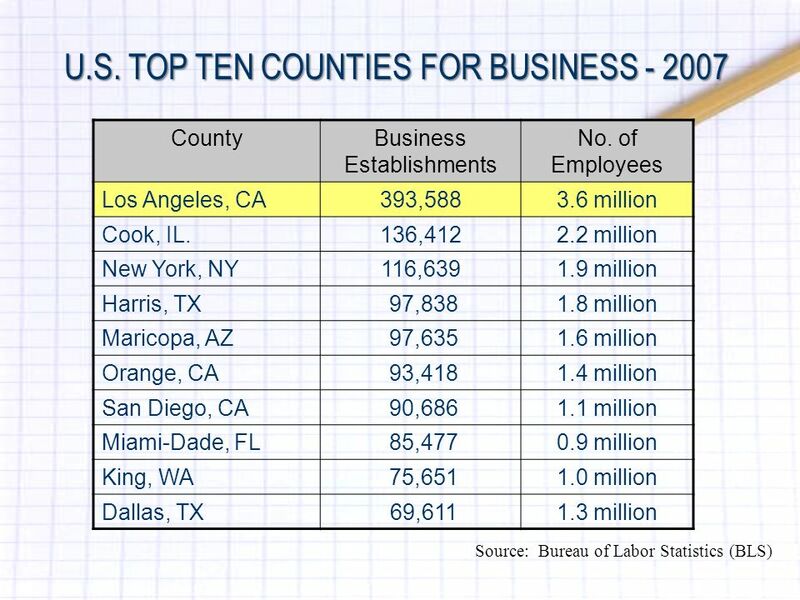 Retain and expand the existing job base while pro-actively attracting new businesses, industries, jobs and investment. 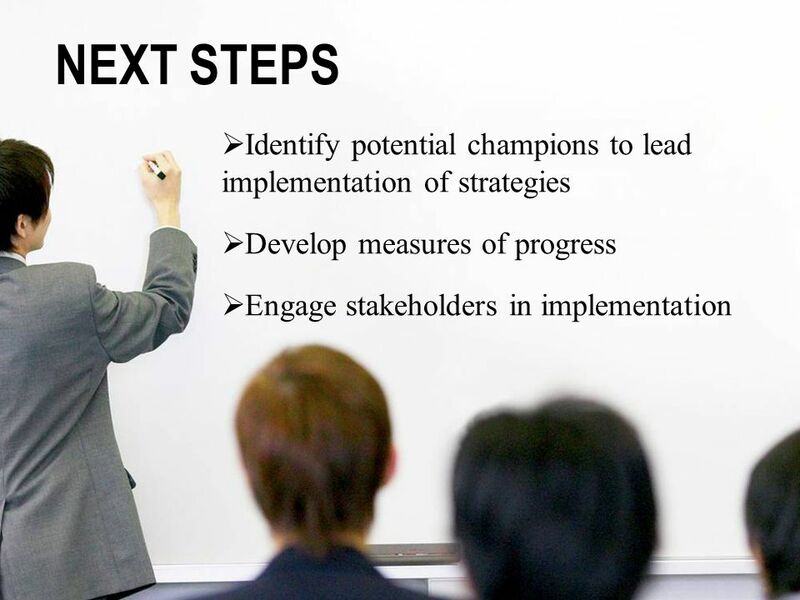 2 Develop sector-specific value propositions and strategies. 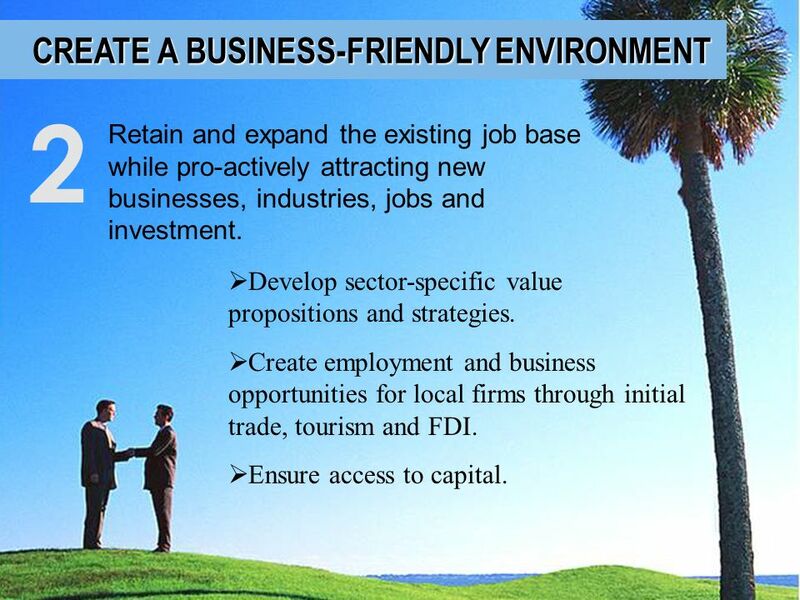 Create employment and business opportunities for local firms through initial trade, tourism and FDI. Ensure access to capital. Leverage the County’s research and development facilities for the commercialization of research, technology and similar opportunities. 3 Aggressively seek more research funding. Create a more supportive infrastructure and stronger networks to facilitate commercialization. Make our communities more desirable places to live. 1 Ensure public safety. Improve mobility and reduce traffic congestion and its environmental impacts through technology, transit, incentives, and jobs/housing balance. Remove obstacles and create incentives to encourage the construction of a large quantity and wide range of housing of all type. Make our communities more desirable places to live. 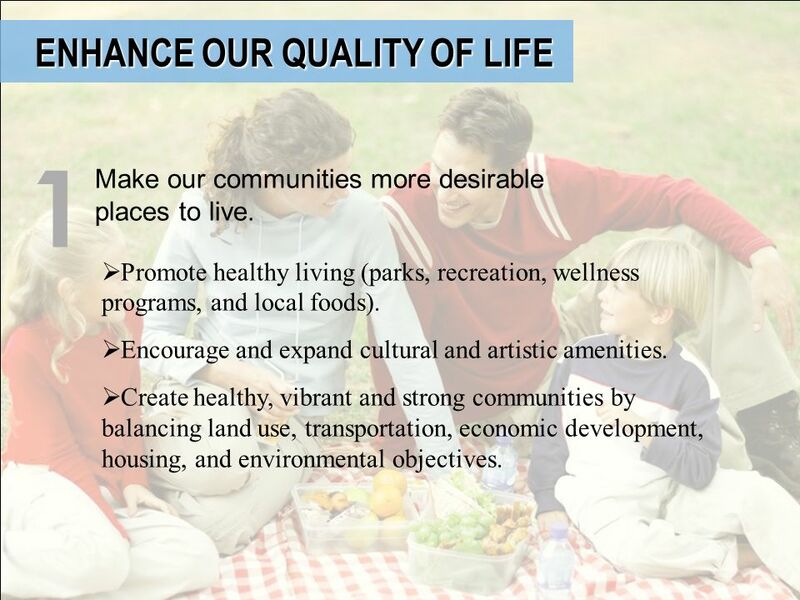 1 Promote healthy living (parks, recreation, wellness programs, and local foods). 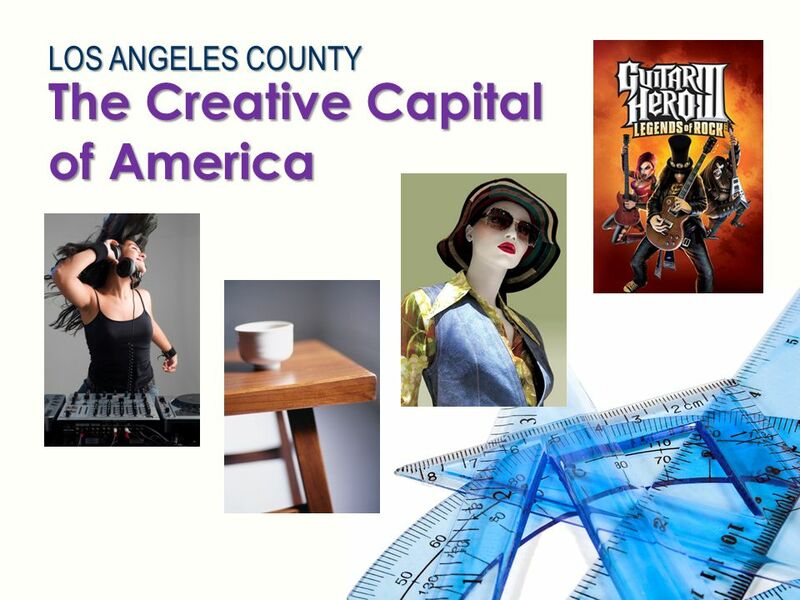 Encourage and expand cultural and artistic amenities. 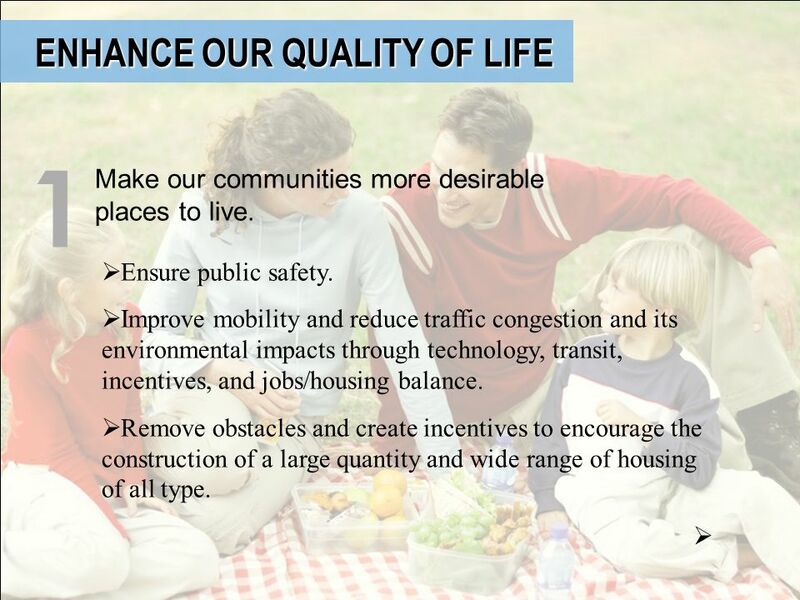 Create healthy, vibrant and strong communities by balancing land use, transportation, economic development, housing, and environmental objectives. Use all available resources (i.e., Hope VI funding, etc.) and adopt new approaches to revitalize low- income communities. 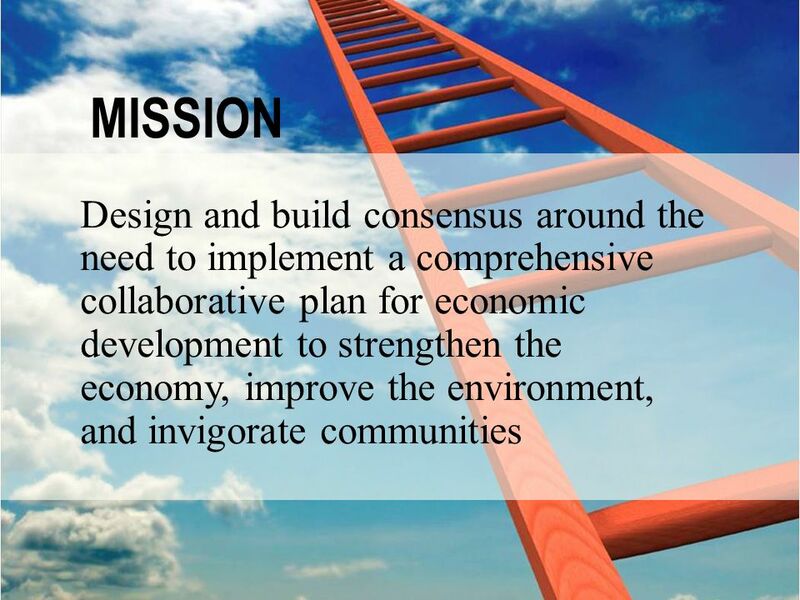 2 Increase community participation in the planning and jobs creation process. 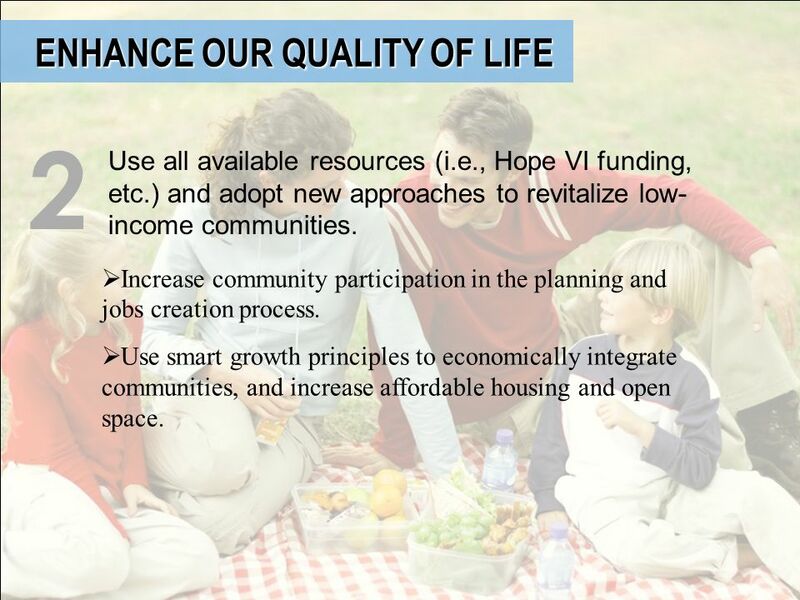 Use smart growth principles to economically integrate communities, and increase affordable housing and open space. 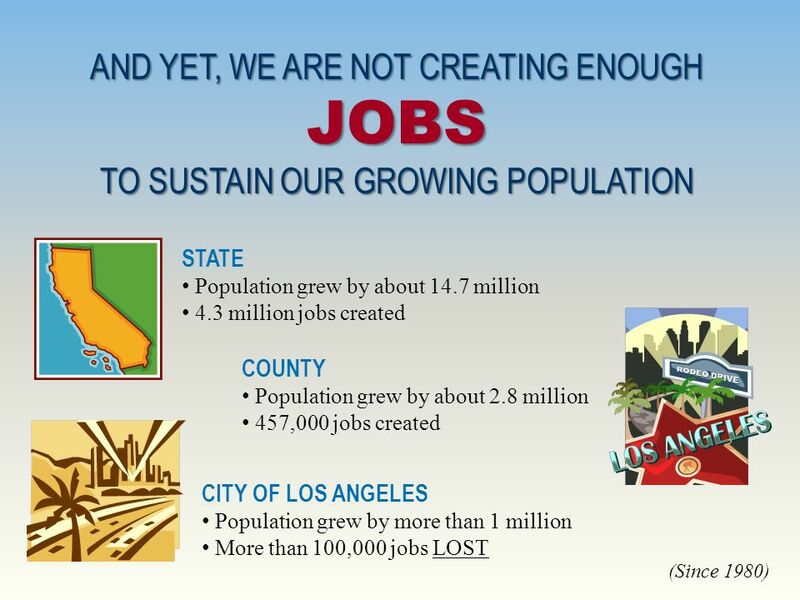 Maintain an adequate supply of jobs-creating land. 1 Create and maintain a database of County-wide, jobs- creating land. Implement an employment land preservation policy. Maintain an adequate supply of jobs-creating land. 1 Make better use of the public sector’s real estate portfolio. Reserve employment land (existing and vacant) for research and development uses. Develop and rehabilitate land to meet strategic economic development objectives. 2 Update general, community and specific plans. Develop, adopt and implement an incentive program for commercial and industrial activities. Create and promote public/private collaborations to facilitate infill development and brownfield redevelopment. Develop and rehabilitate land to meet strategic economic development objectives. 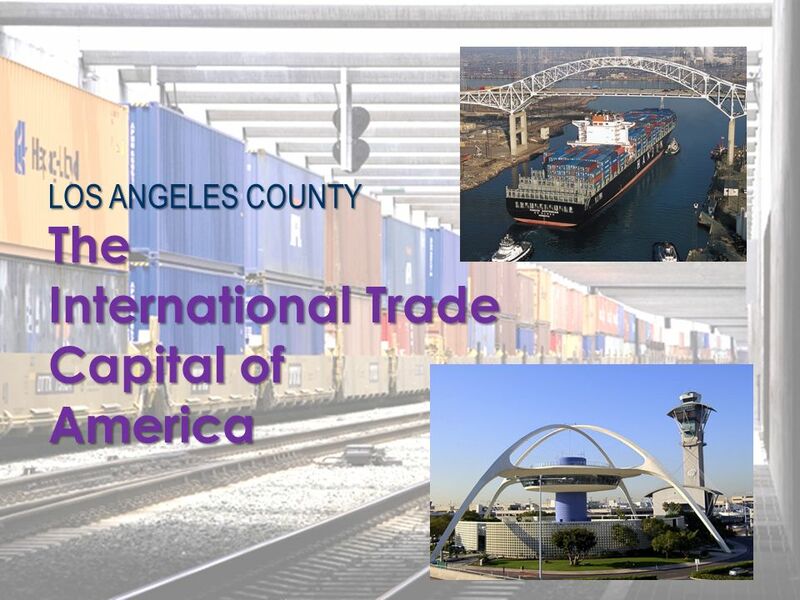 2 Collaborate on securing state and federal grants, tax incentives and zones. 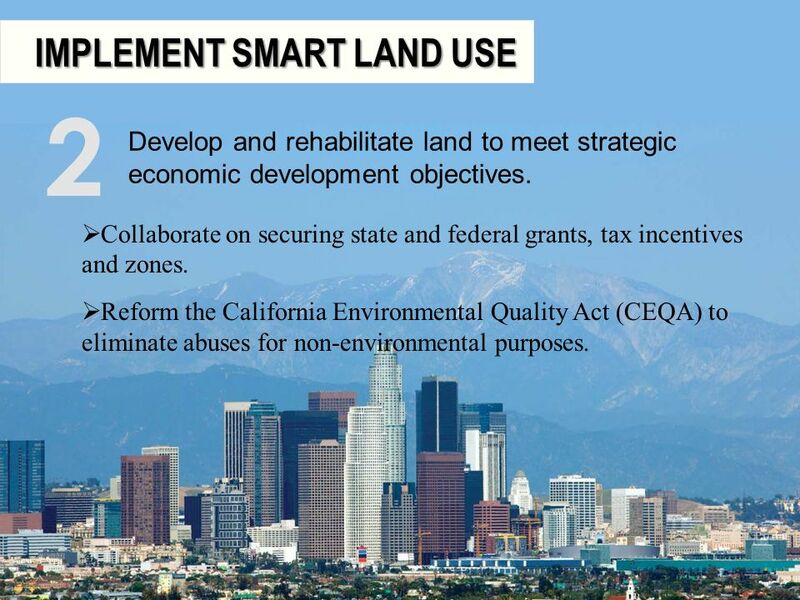 Reform the California Environmental Quality Act (CEQA) to eliminate abuses for non-environmental purposes. 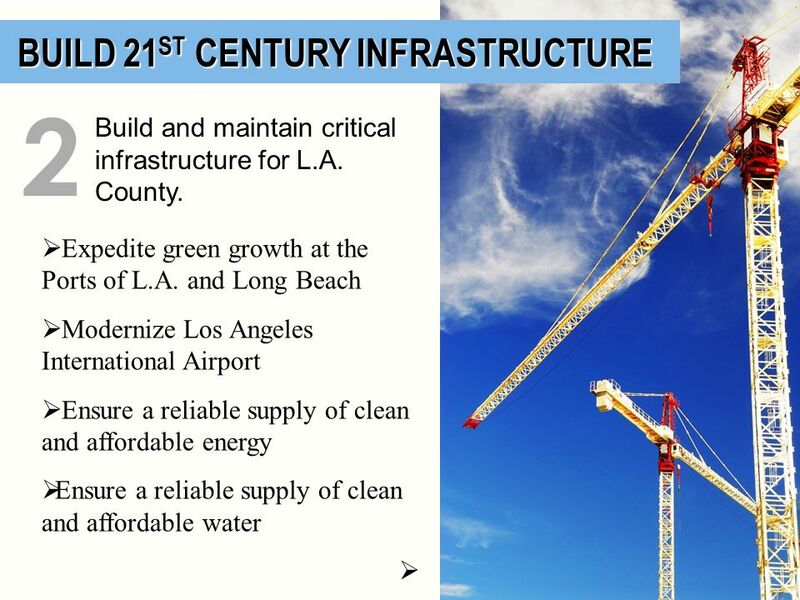 Fix the broken infrastructure development process. 1 Restore the balance between local and regional interests. Promote enabling legislation allowing for best practices (e.g. 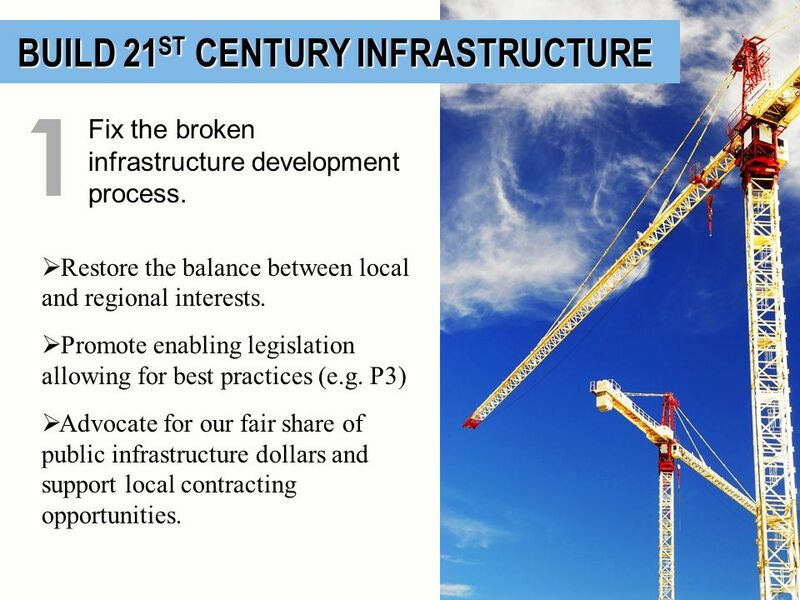 P3) Advocate for our fair share of public infrastructure dollars and support local contracting opportunities. Build and maintain critical infrastructure for L.A. County. 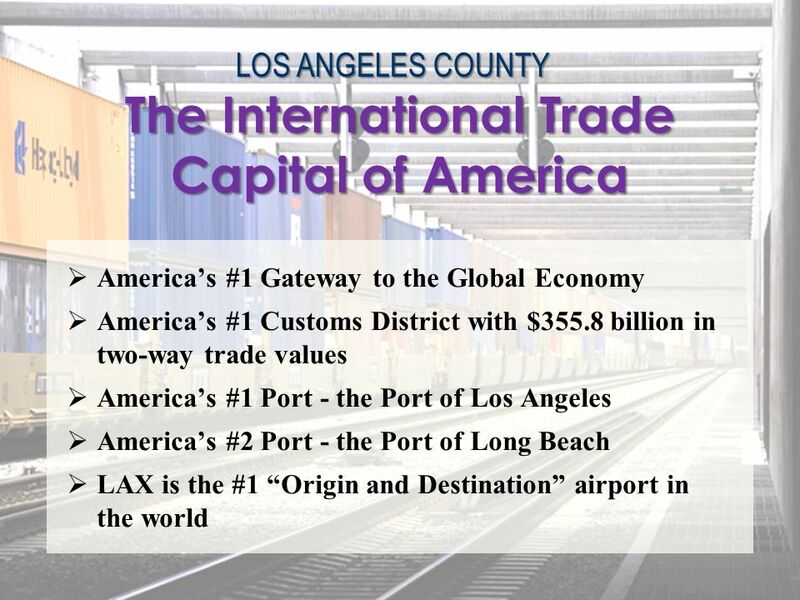 2 Create a world-class ground transportation network. Improve waste-handling capabilities. Support public and private efforts to continuously improve wired and wireless communications networks. 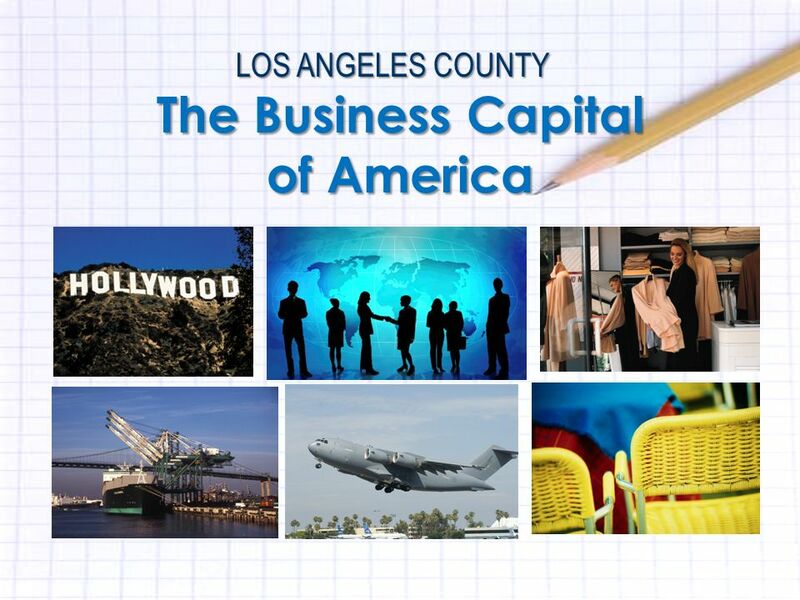 Download ppt "A Consensus Strategic Plan for Economic Development in Los Angeles County Bill Allen President & CEO Los Angeles County Economic Development Corporation." LOCAL GOVERNMENTS AS AGENTS OF CHANGE John Day Center for Environmental Farming Systems, NC State University. Steve Griffitts, President Joe Dunlap, Ed.D., President. RMI Update Sustainability Directors Conference Boulder, Co November 2 nd and 3 rd, 2006. What is the Lane Livability Consortium? Participating Agencies  City of Eugene  City of Springfield  Lane County  Lane Transit. 1 FY 2016 Budget Briefing February 2015 FY 2016 Budget Briefing February 2015 U.S. D EPARTMENT OF C OMMERCE. Hamburg A Blueprint Community. WHAT IS BLUEPRINT? We are a group formed by the community, for the community. We are charged with improving the quality. Public Workshop Welcome -to the -. What is the ? 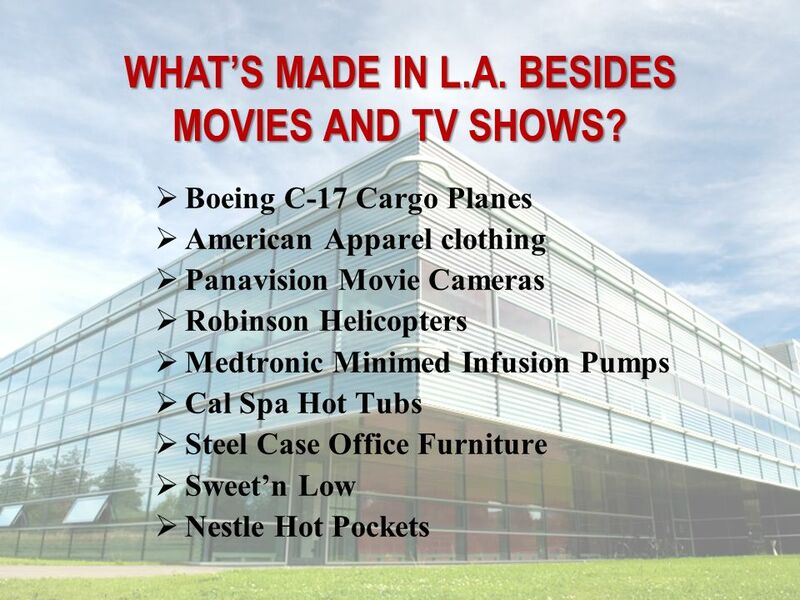 Economic Development Benefit/Cost Transit Slides. Strategic Overview. CPUC ORDERED ESTABLISHMENT OF CALIFORNIA EMERGING TECHNOLOGY FUND  Condition of approval of 2005 mergers of SBC-AT&T and Verizon-MCI.